1. My mom is hard to shop for – any unique ideas for Mother’s Day gifts? Mother’s Day gifts that (we think) are hard to go wrong with are: spa gift certificate (facial, mani/pedi, blowout, or massage), a photo book of current and past family photos (or a framed photograph), a necklace or bracelet with family initials, a new phone case, or a coupon book (like the kind you made when you were little lol) with a few special mother/daughter dates – lunch date, mani/pedi date, movie date, happy hour date, etc. As moms, we can say that personalized/thoughtful gifts are really special and mean the most! 2. What are your favorite wedge sandals? This is going to be a long list 😉 We both have these Chloe wedges and looove them! This pair and this pair are similar but a little more budget-friendly. If you’re looking to splurge, we love these and these. And if you want to save, these are a great option for under $130. And these three pairs (one // two // three) are under $100! 3. How do you backup your photos? Looking for a good photo storage solution that will store hi-res and have a print option. Meggan: Ugh I need to start backing up my photos (let me know if any of you have any suggestions!) but I use an app called FreePrints for printing my pics. You get 85 free 4×6 pictures a month and only have to pay for shipping. It’s super easy and convienent! Also, this isn’t a backup or storage solution but I just downloaded this app call Lifecake. It’s an easy way to share pictures of your littles with your family and friends. Brooke: I purchased an external hard drive, and although it seemed a bit pricey (around $100), I’m so happy I did. It will basically never run out of storage space, and I know (as long as I continue to back my stuff up) I’ll never lose anything. 4. I’m starting college this fall and looking to update my wardrobe with cute, yet casual tops, bottoms, or dresses that are versatile. Definitely get basic pieces you can mix and match! This t-shirt dress is cute for running around campus – you can pair it with sandals, sneakers, a sweater, etc. 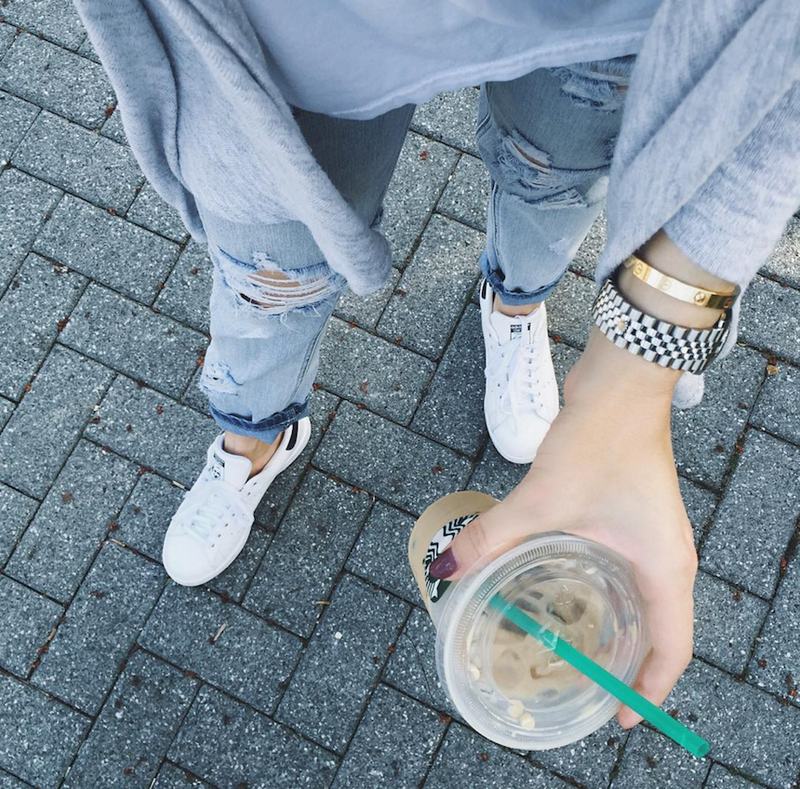 You can’t go wrong with a stripped tee, ripped jeans, and sneakers. A few other pieces we also love this blouse, this skirt, these joggers, and this knot tee – all are cute and can be worked with items already in your wardrobe! 5. What are your favorite fashion sneakers? Brooke: I love my Stan Smiths, Pumas, and Supergas. I’m also kind of dying for a pair of Golden Goose like Meggan’s. Meggan: I wear my Golden Goose sneakers a ton but also love these slip-ons (budget friendly look-a-like here), these Topshop sneakers and this pair with faux fur. I asked Kyle if he liked the faux fur pair, and no couldn’t of came out of his mouth faster – HA! 6. What are your favorite investment pieces you’ve bought? Brooke: I agree – I save my splurges for (mostly) bags, shoes, and coats. I am looking for a new leather jacket – I love my Rebecca Minkoff one, but I also want one that isn’t cropped (tried this one on in store and looooooved it…until I saw the price, still need to shop around). My favorite pieces I’ve bought are this Gucci bag, these lace up flats (so comfortable, I’ve walked miles around the city in them with no problem), and my Canada Goose coat (Meggan and I both have and love)! 7. I have several weddings this summer and would love some ideas on more personal, off-registry gift ideas for showers/weddings! For our wedding, one of our friends cut up our invitation (into pretty strips that curled up), and put them inside clear glass Christmas ornaments. It was such a cute gift that we love getting out every holiday season! There are so many great ideas here as well! 8. Any suggestions for high-quality, yet affordable blazers? Looking for some fun colors or patterns! We have both had good luck with blazers at H&M and ASOS! They are affordable and pretty good quality. This pink one is perfect for spring and so is this stripped one. This sleeveless one is one isn’t colorful but it’s so cute and on trend! 9. I’m interested in selling clothes I no longer wear. Any recommendations on how to go about it? My clothes range from Forever21 to higher end. We have both used Poshmark and have sold quite a few items on it – especially pieces from H&M, Forever21, etc! You can also bring them to consignment shops like Plato’s closet. For high end items we would suggest trying Ebay. You can usually get more $$$. Fashionphile and Trendlee are great for selling designer handbags and accessories. 10. What are your 4-5 must have classic investment handbags and how do you take care of your handbags? 4-5 is a lot, but if you’re wanting to build your collection, we say purchase ones by different designers. YSL (love this one), Gucci (yes please to this one), Chanel (this is a classic), and Celine (love this one) would be our top favorites. We always go for neutral colors when splurging on bags – bright colors are fun, but you’re more likely to get tired of them. 11. How do you organize all your beauty products? Meggan: My bathroom is very small with limited storage so I bought this cabinet to store all my hair and skin products. I keep my makeup in a drawer and use dividers for lipsticks, brushes, etc. I will do a little tour on snapchat this weekend! Brooke: I keep all of my makeup in my GLAMbox, and seriously love it! If you have the counter space, it’s a splurge that’s worth it (in my opinion). 12. I’m looking for an “everyday” black dress for summer that is versatile enough to wear to work, happy hour, etc. This one is is perfect! It’s not too short, would look cute with a blazer and you can dress it down with sandals. A simple shift dress (love this one and this one) is versatile and you can add some flare with accessories! This slipdress is another option and it’s on sale!